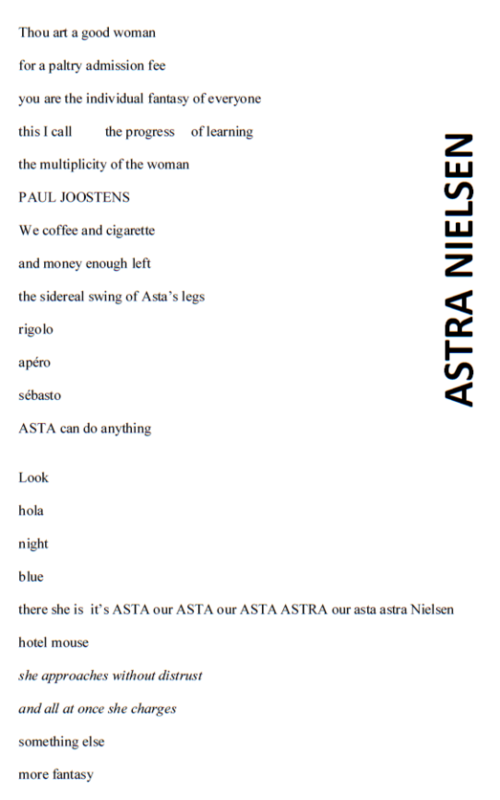 Source: Paul van Ostaijen, ‘Asta Nielsen’, in Bezette Stad (Antwerp: Sienjaal, 1921), reproduced from www.dbnl.org/tekst/osta002verz02_01/osta002verz02_01_0119.php. English translation by Fintan McDonagh, commissioned for this website. Comments: Paul van Ostaijen (1896-1928) was a Belgian poet. His idiosyncratically-designed Bezette Stad (Occupied City) is a collection of poems influenced by Dadism and Expressionism which deals with his life in Antwerp during the First World War. Asta Nielsen was a Danish film actress and one of the leading cinema performers of the 1910s, chiefly popular in Europe. 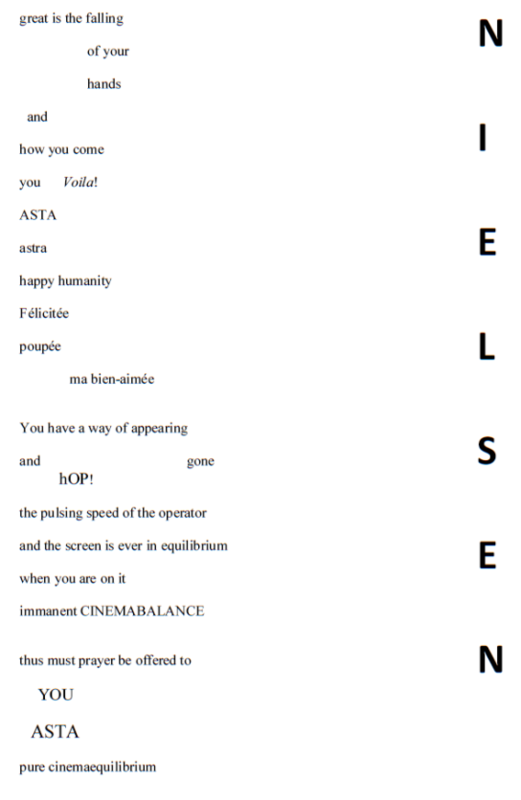 Paul Joostens, the poem’s dedicatee, was a Belgian Dadaist artist and a great lover of cinema. The English translation is by Fintan McDonagh, a Belfast-born film scholar based in the Netherlands, to whom many thanks for having supplied what is probably its first ever English translation. The speaker in the poem especially seems to be interested in Asta’s looks. 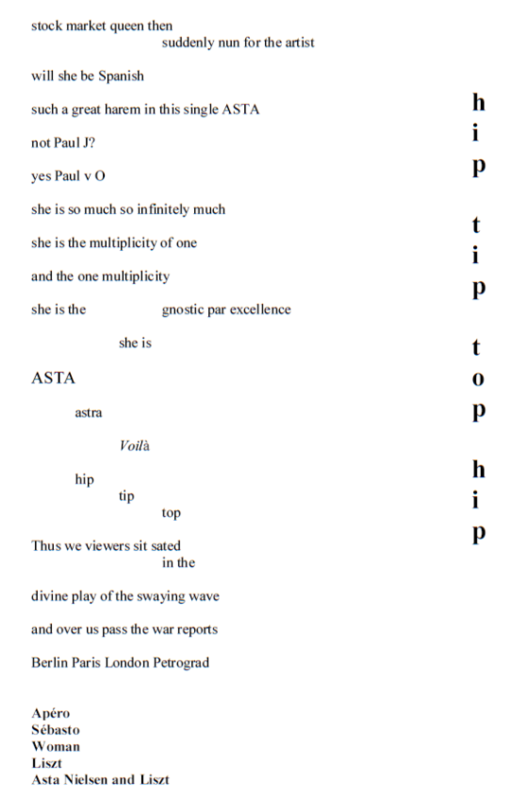 The poem is about the swaying of her hips, about the way in which she erotically puts a flower in her mouth, about her gorgeous balance, her legs, etcetera. 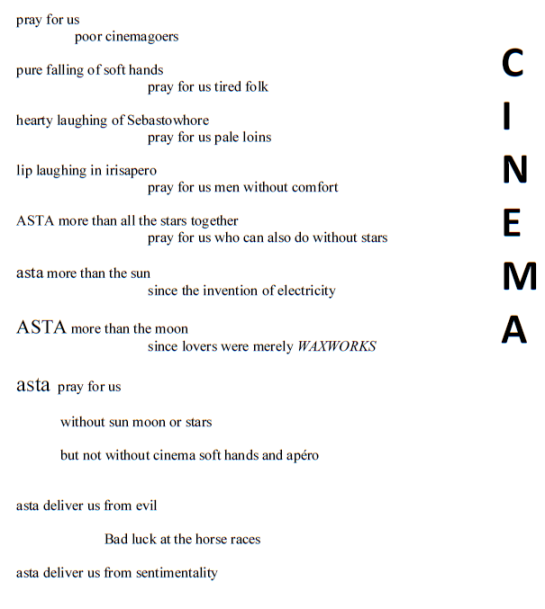 Furthermore, Asta has characteristics of a prostitute: the men who enter the cinema have to pay only little and in exchange for that, Asta adjusts herself to their particular dreams and sneaky desires. 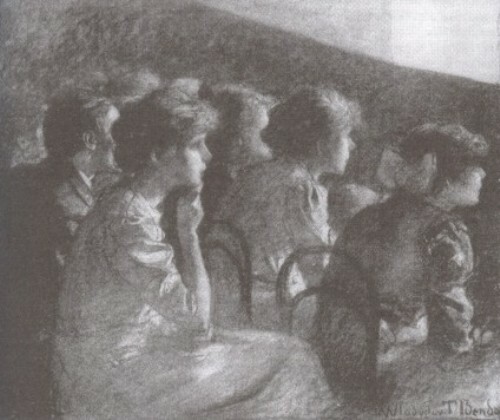 The scenery of the poem is that of a metropolis by night; a world in which only the movies present true and honest love stories. The speaker seems to use this evocation of sensual city-life in order to provoke his Roman Catholic readers. In itself, the setting is provocative enough. 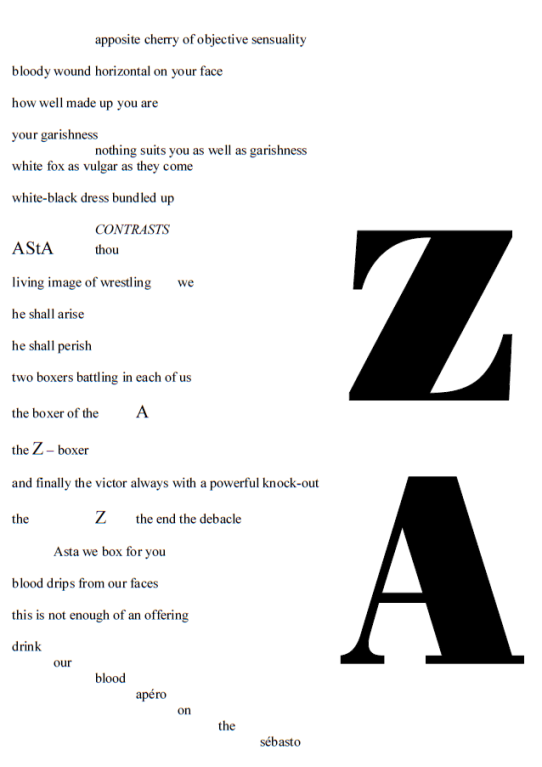 But, to make matters worse, he shamelessly recites a litany in which this amoral Asta takes the place of the Virgin Mary … It is significant that Asta is called ‘Astra’ several times. 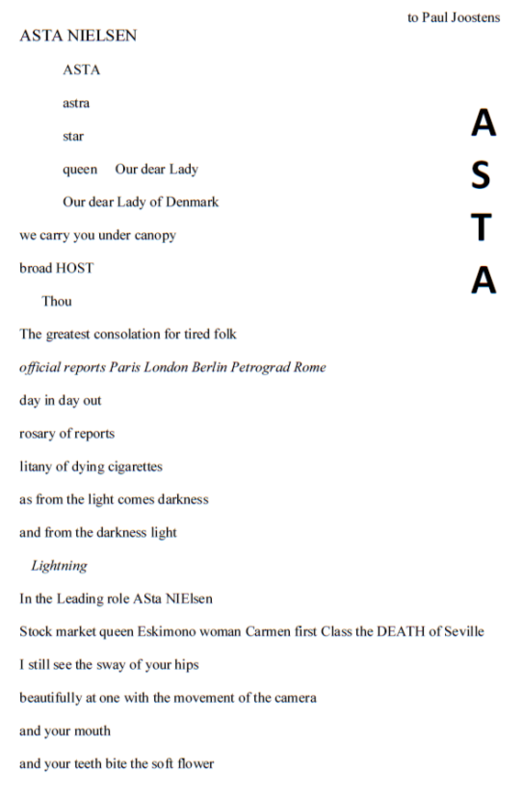 This modification of her first name, which means ‘star’, can of course be related to the notion of a movie-star, but the Dutch word ‘astraal’ is another valid connotation. And that connotation leads us to the heavenly, the elevated. It appears that there is a relation between the everyday scenery of the metropolis and the transcendental. My thanks to Karel Dibbets for drawing my attention to van Ostaijen’s work. 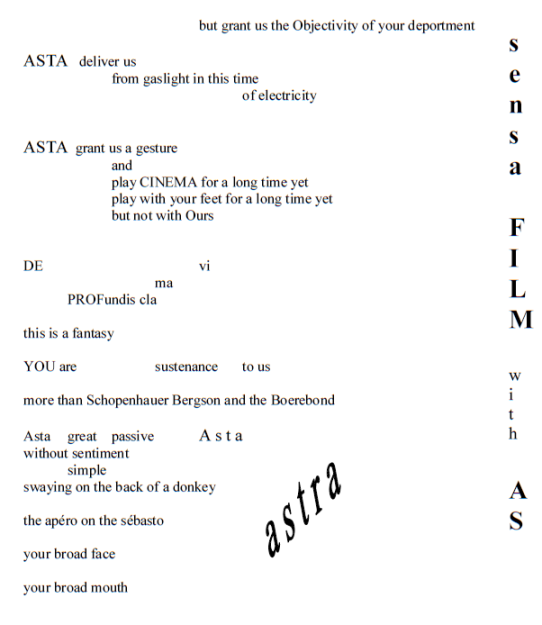 This entry was posted in 1910s, Belgium, Poetry and rhyme and tagged Antwerp, Cinemas, Paul van Ostaijen, Performers. Bookmark the permalink. Pingback: Rest in pieces … Mary Jane’s Mishap (GB 1903) | Silents, Please!